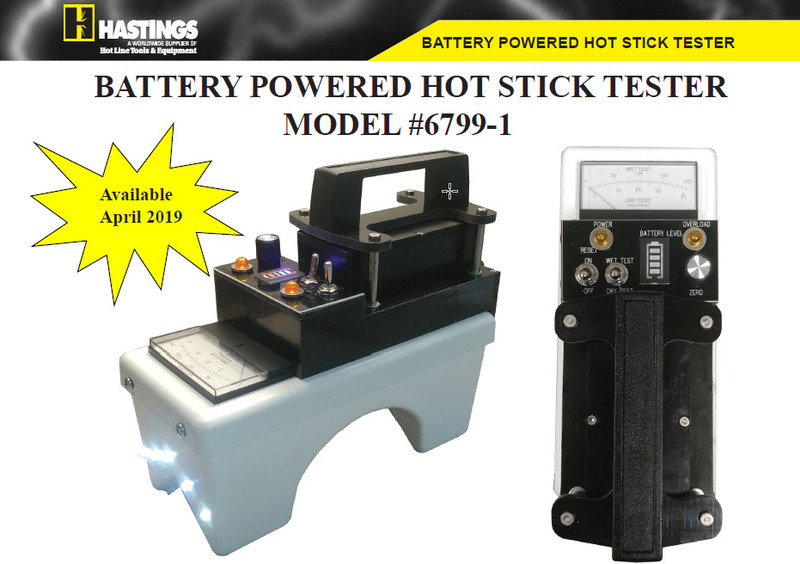 Hastings has a BATTERY POWERED HOT STICK TESTER, Model 6799-1. This new unit is IN STOCK NOW!!! We also have a unit available for demonstrations. Please do not hesitate to contact us if you have any questions or comments. We appreciate your business. Same as our standard hot stick tester model 6799 without the power cord. Testing can be done right at the job site. Lights have been added to aid with visual inspection when testing. Test hot sticks wet or dry. The tester has a selector switch for wet or dry test and a dual range scale which gives the operator leakage current values in micro amps. Utilizing a 2,500 volt output, the meter is calibrated to indicate the leakage values that would be present if 75KVAC were applied to a 1 foot section of the fiberglass tool for the wet test and 100KVAC per foot for the dry test. Three hour battery life. Rechargeable batteries (3 hour recharge time). Swappable batteries. The tester comes complete with Battery, Charger, Instruction Book, DVD, Test Bar and case.